Summer travel season is in full swing. For U.S. vacationers on a budget, a new report from GasBuddy reveals drivers should be particularly careful when filling up near state lines. According to analyst Patrick DeHaan, there is currently a huge difference in gas prices on opposite sides of a handful of U.S. state borders. In some extreme cases, filling up on the wrong side of a state line can cost drivers an extra $25. “Usually, traveling across state borders isn’t an event that stocks out to motorists who might be busy taking pictures of the welcome signs, but gas prices can stealthily surge just by crossing over the state line,” DeHaan said. For some travelers who live within miles of a state line, going out of the way to fill up has become a worthwhile endeavor. 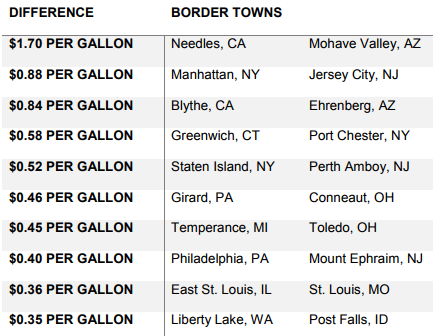 GasBuddy reports that the biggest jump in gas prices across a state line anywhere in the country is the $1.70 per gallon price differential between gas prices in border towns Needles, California, and Mohave Valley, Arizona. U.S. motorists are already paying more for gas than they were this time last year. The average national gas price is currently around $2.31 per gallon, up from around $2.14 per gallon a year ago. Drivers in Hawaii are currently paying the most for gasoline of any state at $3.04 per gallon. South Carolina drivers are getting the cheapest gas of any state at only $1.99.